As confounded interest write's Fed head Jerome Powell continue's to raise rates and let Treasury Notes on their $4.4 trillion balance mature, we are seeing financial market disruptions, such as spikes in the stock market and 10-year Treasury Note volatility. But the one asset that is seeing a decline in volatility is gold. 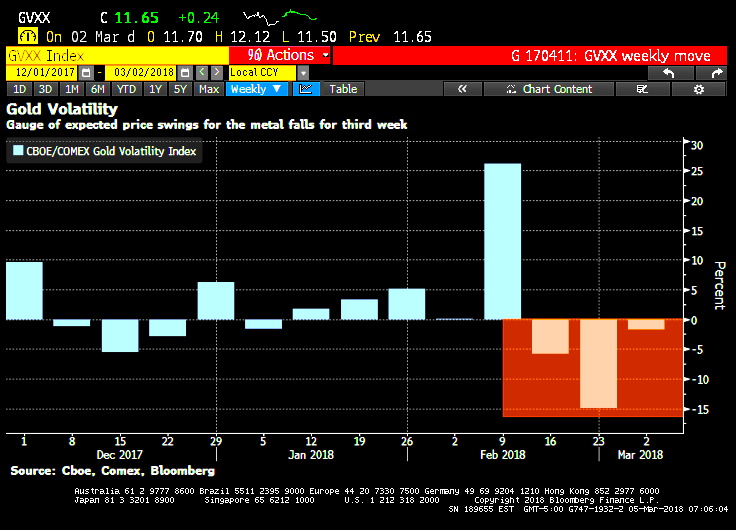 (Bloomberg) — While volatility surged across asset classes last week, a gauge tracking the cost of hedging against price swings in gold fell. The CBOE/COMEX Gold Volatility Index dropped for a third straight week, the longest streak of the year, as the biggest exchange-traded fund tracking bullion posted its longest run of inflows since September. With the prospect of higher inflation and U.S. tariffs on metals, investors are turning to havens such as gold.